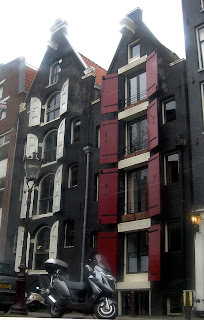 I wasn't sure that I would write more about Amsterdam, but I had such a full day yesterday that I thought I'd at least give you brief descriptions of the things I did and a photo or two of each as well. I'm also calling this post the re-mix because I have learned more and revised some opinions in my first post. 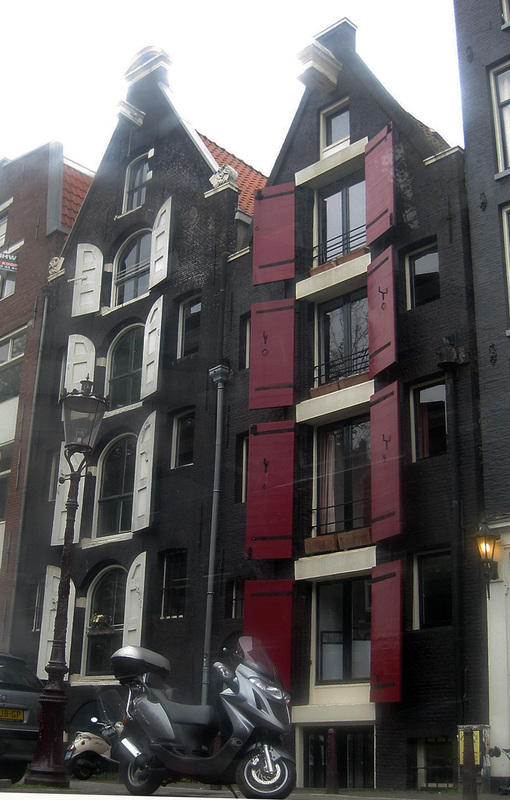 In this post, no more stories of my youth, of critical comparisons between Amsterdam and other great cities, nor really stretching re a song about Amsterdam to put it in synch with my experience of it! As Joe Friday used to say, "Just the facts, ma'am." 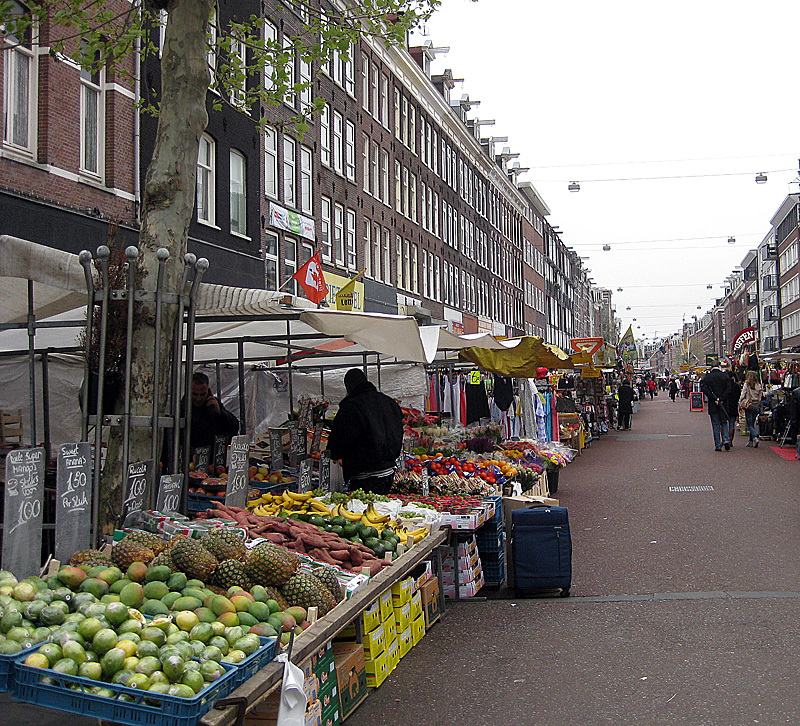 towards the Albert Cuyp Market -- a gigantic affair down several long blocks of the street named for that major landscape painter from the seventeenth century. It consists of items similar, for the most part, to other such markets, but there's a lot of it, and even before ten am it was a-bustle! 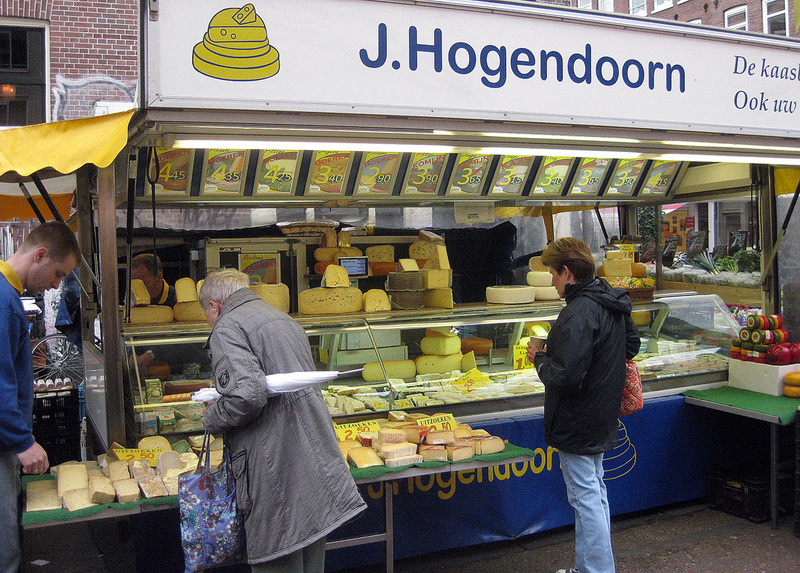 What the market featured that others do not, at least not specifically, are beautiful Dutch flowers and wonderful Dutch cheeses! 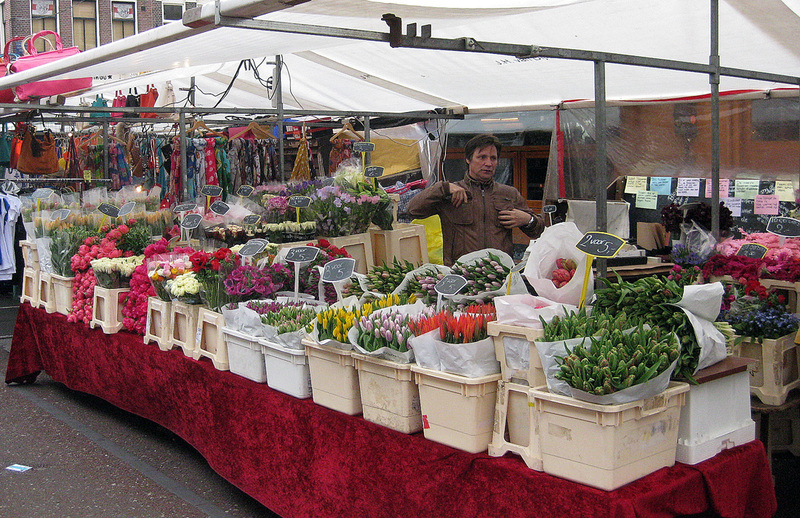 That made it more of a joy to stroll through for Dottore Gianni, who likes flowers and LOVES cheese. 10:30 am - from the market, walked again purposefully in the direction of Museumplein, to finally get into the Rijksmuseum. 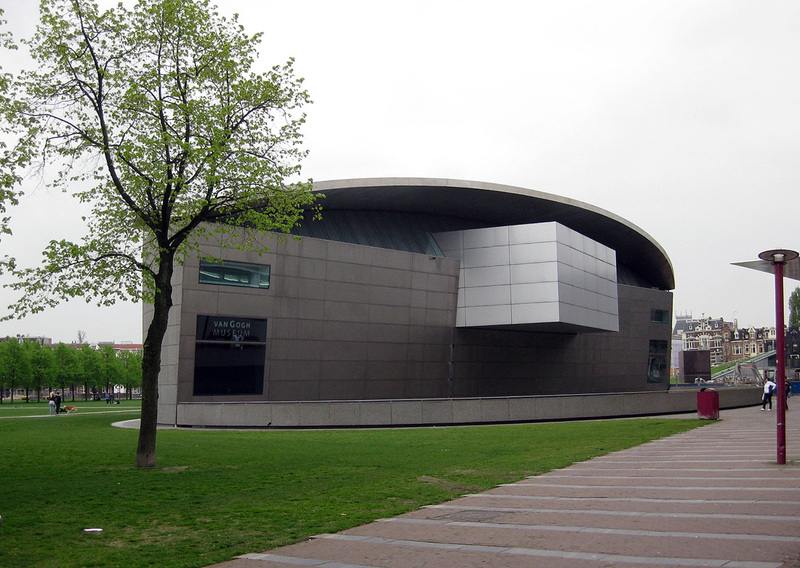 A very large part of this museum is closed for renovation, but its guardians have wisely placed a number of excellent seventeenth century paintings, sculptures and other arts and artifacts on display so that tourists will not be completely disappointed to find it closed completely. And this tourist was not disappointed, except by the crowds that were slogging through the collection. 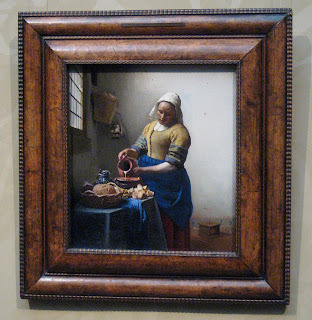 For me the highlights were the Rembrandts, the Vermeers and also the work of Jan Steen, who may be less known to some of you, but who specialized in ordinary life, wittily, but in a touching manner as well. A lot of Euros for a few rooms, but the rooms were packed with excellenxe, and one can see why the Rijksmuseum is one of the world's great centers for fine art. 12 pm - high noon -- was headed, purposefully again, on a search for the perfect Dutch pancake, but for one of the few times during my time here, even though there was a persistent threat of rain, the actual substance appeared, really lightly but I didn't want to take the chance that light rain would turn into a downpour. 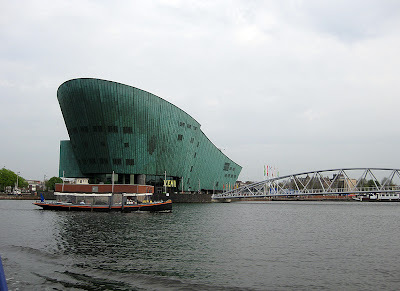 I happened to be near the starting point for Blue Boat tours, which is not at all far from the Rijks and other museums in that fine place called Museumplein, and a boat was about to leave, so I joined the tour. Avid readers of Dottore Gianni (hello out there!) will remember that one of the first things I did upon arrival in Amsterdam was to take a boat tour, and in fact from the same company. It may seem a little silly, even a waste of money, to take the tour again, BUT! On the first trip I opted to stay outside the long cabin, in order to have the freedom to take good photos in a way that would have been impossible inside. This time I stayed in the cabin, even though the rain had stopped, to hear the commentary via a headset -- there were at least 15 languages represented -- guess which one I chose? You see, I make you work while reading this blog! 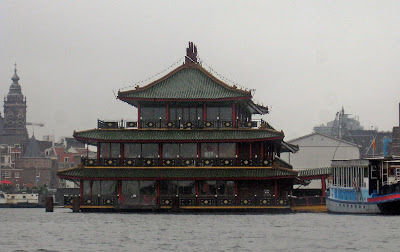 And I was very glad to remain in the cabin, not just because of the rain outside it, but also the narrative gave me good information on many people, places, things that I had no way of knowing on my first go-round. 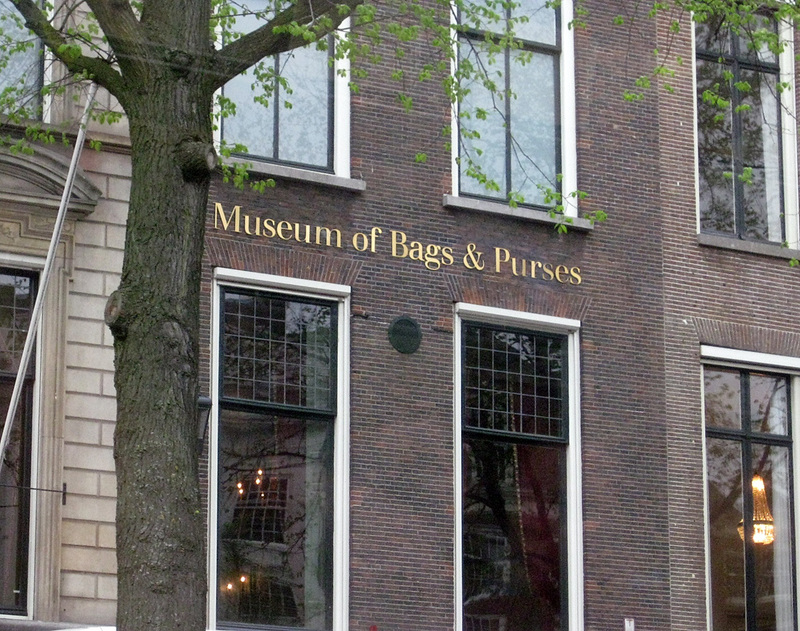 And of course what is Amsterdam best known for? 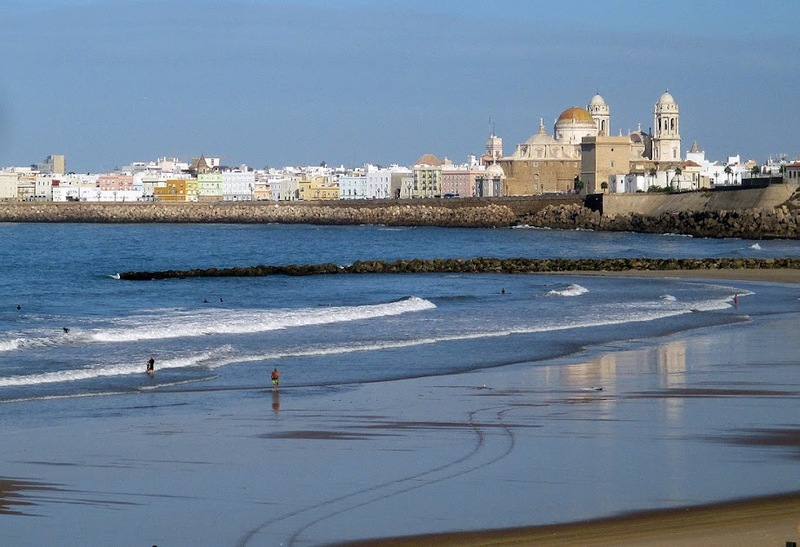 Its canals! 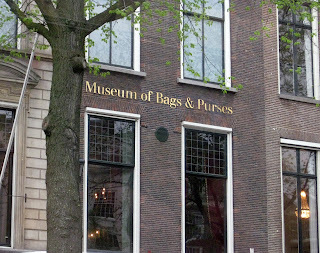 I learned many things, starting with why Amsterdam is so named. Why, you ask? 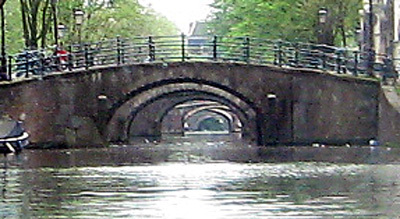 Because it was a dam placed on the River Amstel (light dawns on readers who know Amstel only as Light, consumed in the ale house of their choice). So, this Amstel Dam morphed into one word. 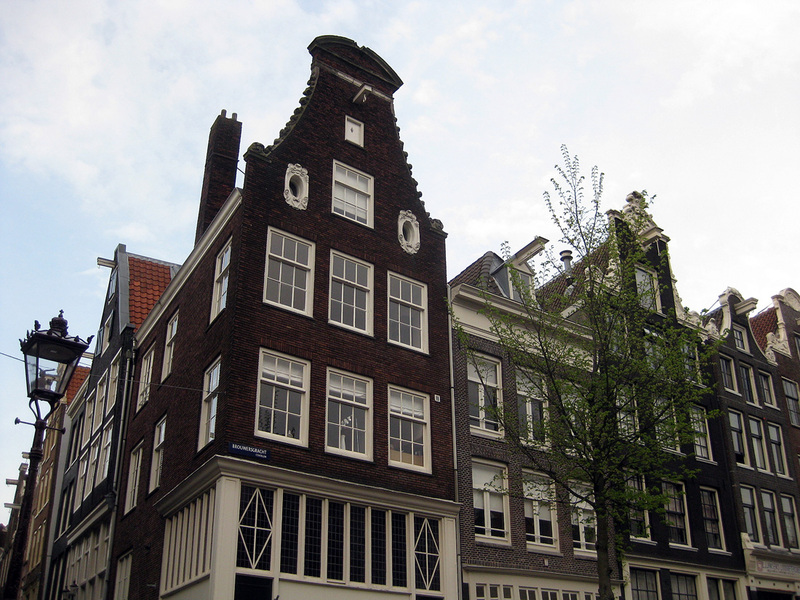 I more or less knew that Amsterdam could not have been what it was without dykes, which protected it from the sea. A major such dyke was placed at the point where the sea met a large inlet, and that inlet is now called Lake Ai. Quite the lake indeed! This is where cruise ships come in, where cruises to and through the Rhine begin; it is the site, recently, of many social and cultural centers such as NEMO, in state of the art buildings designed, as that one was, by Renzo Piano and his ilk; there is even Europe's floating restaurant, The Sea Palace, shaped as a pagoda! Don't ask...I didn't. and one that wasn't seen on the tour but described in the commentary, The Cats in Art Museum, which was started by rich man and (having heard of that museum I can now attest) eccentric, JP Morgan! Unfortunately I also learned to hate the commentators, called Ron and Nell in the English language version, probably Jacques and Marianne in the French, a supposed married couple who have lived in Amsterdam for many years, who bicker cheerfully and who, while giving out important information about the city and its environs, were created to satisfy the largest number in the most inane way. Ah well, I DID get the information. 1:45 pm -- wanted to get on with my touring, but was also in dire need of sustenance. 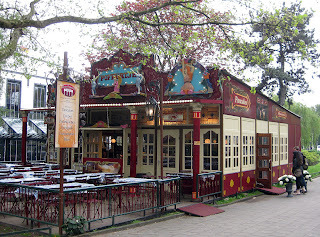 My first stop was to a pancake house near where the tour began (very close to the Vondel Park), a charming place overlooking the canal, even sat down. But no one was in a hurry to wait on me, and as I looked at the prices I balked. I know I had seen pancakes priced much cheaply than between 10 and 12 Euros. So I decided to hold the pancake concept for supper, left, and amazingly no one missed me as I went out the door. 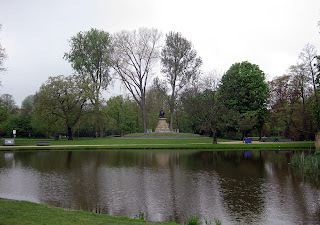 I then headed into the Vondel Park, as I read that it was a large and lovely green space in the city. And that is definitely true. It's described as similar to an English Garden, but having seen many different-looking English Gardens in the course of this near year I was not so sure. 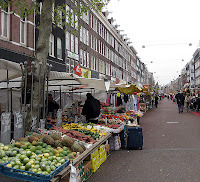 I took a brisk walk through a good bit of it, also searching for fast and inexpensive food. I found two places but neither looked particularly fast and neither was inexpensive, so I headed back in the direction of the Museumplein in general and the Van Gogh Museum in particular. 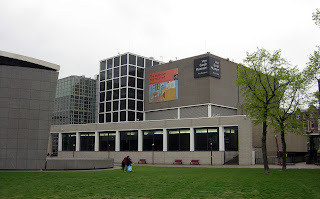 While on the way I remembered that there were several outside stands between the Van Gogh and the Rijksmuseum, so I made a bee-line for those and found a home-made tuna sandwich which was absolutely delicious. By the time I finished eating it was 2:40, and I quickly joined the Van Gogh queue. I'll have to go back to "line" beginning tomorrow when I head back to the U.S., but for now it's still going to be "queue," a term I've grown rather fond of. It is simply a more interesting word than "line," if only in the amazing number of vowels in a one-syllable word, wouldn't you say? 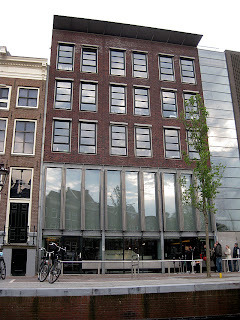 Just to point this out to any of my readers who've not yet been to Amsterdam, there are constant queues at all three of the major museums, The Rijks, the Van Gogh, and especially the Anne Frank House. Whereas queues for the first two are not particularly daunting, at least they weren't during my visit, the queues at the Anne Frank House are the longest I saw in the city -- and they WERE daunting, so much so that I gave up on trying to see it. Perhaps had the weather been better, perhaps had I given myself another day or so in Amsterdam ...sorry to have missed it. Interestingly, the only other queues I saw that were anything like as long as that for the Anne Frank were for...well, I wonder if you can guess. Think tacky. OK, now think REALLY tacky...and add waxy...you guessed it, Mme Tussaud's! And you should have guessed it after those clues! 3 pm -- after a not terribly long wait in the Van Gogh queue, I entered what for me was the highlight (along with the canals) of my trip! 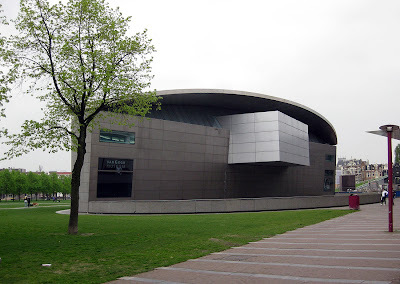 I am not going to take time to describe the museum, except to say that you can see an excellent selection of the master's paintings in chronological order, and also the works by others who influenced him and who were colleagues. A really fine special exhibition called Dreams of Nature, Symbolism from Van Gogh to Kandinsky was included in the price of the main museum but placed in the newer addition to the museum in the fascinating building adjacent to it, which you can barely see on the left in the photo above, but which I'll show you just below. 4:30 pm -- I strolled back to the hotel, again purposefully, because though I was content with all I had seen on this last day, I was also very tired. After a brief rest I headed out again at about 6:30 pm for the last time on my last day, to finally get myself a proper Dutch pancake. 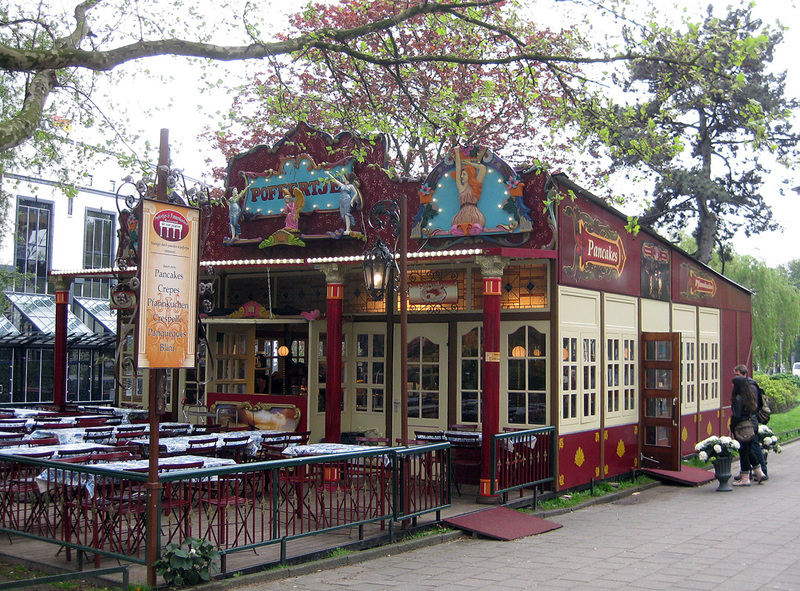 I found it at the same place near my hotel where I'd eaten the night before, when hunger got the better of me and instead of a pancake I'd had wiener schnitzel. 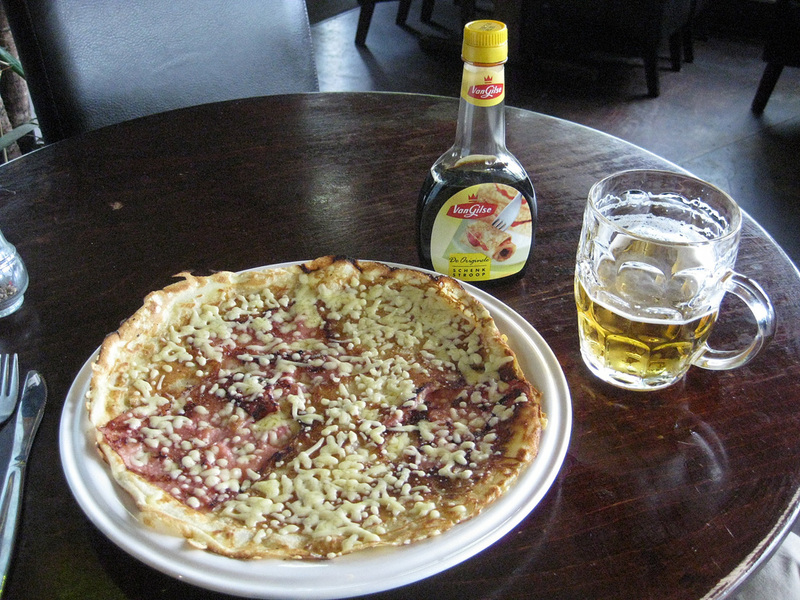 This time I ordered another pint of Heineken (which tastes better from a tap than in a can or bottle, I must say) and a ham and cheese savoury pancake, which was delicious! Here the service was friendly and quick, the server recommended the sauce you see in the photo, not dissimilar to maple syrup, and all in all it was a great way to end my last day out. Back then to the hotel, work on blog and photos etc etc, and then a good sound sleep before my day of departure. A brief coda, containing a part of the re-mix: you may remember from my first Amsterdam blog that I had a very angry taxi driver. Well for the ride back to Centraal Station I had a very friendly driver, who instantly struck up a conversation. He is Turkish, though born in Amsterdam and a life-long citizen of the city. We chatted about a number of things. 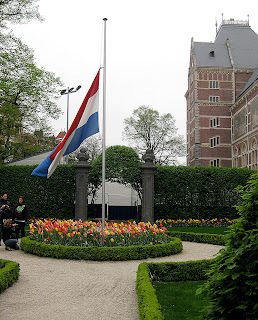 He was very open, noting at one point that he felt somewhat like a stranger in a strange land, as while his roots were Turkish he knew much more about the Netherlands, but at the same time also felt that feeling that I have described concerning myself in earlier posts. I got the feeling that he didn't really mind feeling that way, that it was just a fact. And while he had much better reason than I do for his feeling, I felt an instant bond with this man I'd never see again. 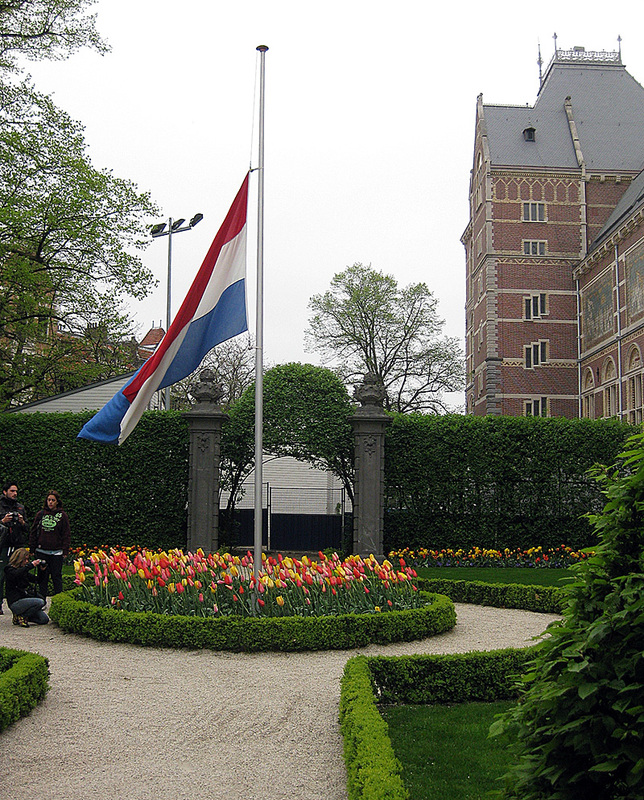 He also told me about Queen's Day, which took place the day before I arrived. This is a great celebration of Dutch Queen Beatrix, who is not quite as old as Queen Elizabeth, and who has ruled not nearly so long, but is dearly loved by the people. He described the celebration as wonderful for Amsterdam, but hell for taxi drivers, as all the streets were filled with people, so it was nearly impossible to drive. He took another customer to the rail station on that day, and it took more than an hour. We did it easily in 10 to 15 minutes. And the next day (my first day, or evening, in Amsterdam) there was a major football match which also made the city crazy. Now I realized why I'd thought the place so dirty when I was first there -- one day a ridiculously huge party, the next another sort of party, probably more rowdy if not quite as large, because a football match. No wonder the streets were still strewn with beer cans and such! 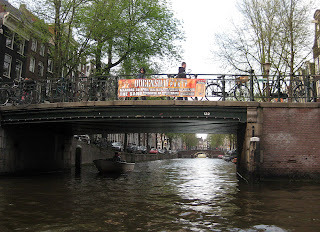 This was not a usual time in Amsterdam, but just after two huge events. RE-mix that part of my first post please! I love fast trains and the Thalys that took us from Amsterdam to Brussels was very fast indeed, the Eurostar which got us from Brussels back to London even faster! I would start a paragraph on why the U.S. is foolish not to invest in similar fast rail travel, but that would end as a long tirade. Instead I'll just say that I really enjoyed my time in the dam upon the Amstel, and felt quite a bit bittersweet on the return journey, my last save one (the trip tomorrow to Heathrow) in my great near year here, on this side of the great pond. I hope your trip back to the US went okay!